Hi there, I am a student at Carnegie Mellon Robotics Institute pursuing a Master's of Science in Robotics Systems Development, with planned graduation date Dec 2014. I graduated from Georgia Tech with a BSME and a BSCS, specializing in Modeling/Simulation and Artificial Intelligence. I love building robots, designing their minds, and developing large-scale distributed simulations and services, especially on the cloud. I'm certain that the future of robotics and drone technologies involves cloud-based intelligence augmenting the physical robot as much as smartphones are augmenting humans, and I am actively researching ways to merge these fields. I have interned at Google, SpaceX, and Amazon, which has given me a broad range of experience in designing and developing code that is extremely simple, reliable, and scalable. I've designed the Climate Cloud Configurator (C3) prototype service automating configuration and deployment of Community Earth System Model (CESM) simulations on the Amazon EC2 Cloud, that is part of a published article in IEEE Computer Society. I was accepted to go to the SuperComputing 2012 conference Nov '12 as one of 25 undergraduates selected for The Experiencing HPC for Undergraduates program, in part due to my academic coursework in HPC where I developed simulation code in C and Cuda to run on Georgia Tech's Jinx supercomputing cluster with NVIDIA Fermi graphics cards. I was also the only undergraduate ambassador for Georgia Tech at the conference. I was accepted to attend NYU Abu Dhabi Hackathon as the international representative for Carnegie Mellon. Our team WellSense won 3rd place in the 2-day hackathon for building a cost-effective software & hardware water-well pump monitoring system that costs $30 instead of the $860 solution currently in place. Sameer Ansari, Rocky Dunlap. "Automatic Configuration of CESM/CCSM4 on Amazon EC2 Cloud.” Tech. Georgia Institute of Technology (2010). SMARTech..
V. Balaji, Sameer Ansari, Aparna Radhakrishnan (2011), "Challenges in Analysis and Visualization of Large Earth Science Data Sets I." 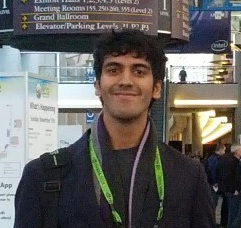 Abstract IN41C-01 presented at 2010 Fall Meeting, AGU, San Francisco, Calif., 8 Dec. I interned with the Google Cloud Platform team - Cloud Solutions in Mountainview, CA, where we developed and published an open-source sample mobile application called SmashPix that demonstrates the full cloud ecosystem using Google technologies such as Android mobile, App Engine, Compute Engine, Cloud Storage, and Cloud Endpoints. I am a Google App Engine Qualified Developer. I interned at SpaceX for 5 months Jan-May 2013 as an Avionics intern - Flight Software in Hawthorne, CA. Among the projects I worked on, I extended three and developed two new GNC (Guidance, Navigation, Control) algorithms for the Falcon rocket flight computer. I also developed on the Dragon spacecraft flight computer creating a more powerful and extendable telemetry system to improve the performance of onboard telemetry logging for the Falcon 9 v1.1 launch and onwards, resulting in a magnitude increase in the amount of telemetry available from the flight computer. I also performed full-stack design and deveopment of a database API as well as front-end interaction extending inhouse data warehousing, visualization & real-time analysis of flight telemetry. The data warehouse extension was prototyped and implemented in 6 weeks (from the start of internship), and pushed out to Cape Canaveral, Hawthorne mission control and Texas. It was extremely useful during the CRS-2 Flight and is now an ongoing development project for the next and future flights. Summer 2012 with Amazon Music in San Francisco, where I performed R&D to improve the performance of a quality checking service that ran on Amazon's Mp3 Catalog. I researched and implemented new technologies and methods in an Agile environment that increased performance by 350%, resulting in a massive reduction of the host fleet needed to run the service as well as creating new opportunities. Interned with NOAA at the Geophysical Fluid Dynamics Laboratory as a summer student in the Princeton Atmospheric & Oceanic Sciences Dept., where I designed a web-service for running analysis scripts on climate model output that was presented at the AGU 2011 Conference Abstract #(IN41C-01).